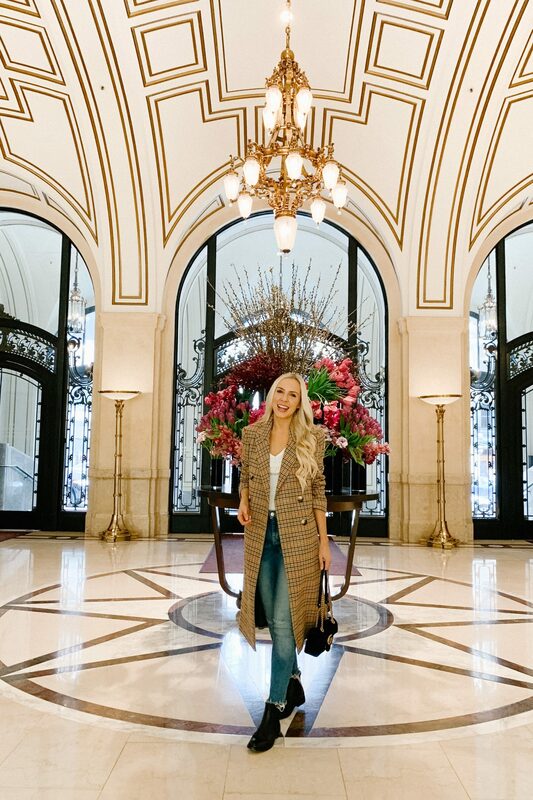 We both needed to hit the pause button and checking into the gorgeous Palace Hotel San Francisco for the weekend was just what the doctor ordered! Just the two of us, with a two night stay to relax, reconnect and pretend we were newlyweds again. 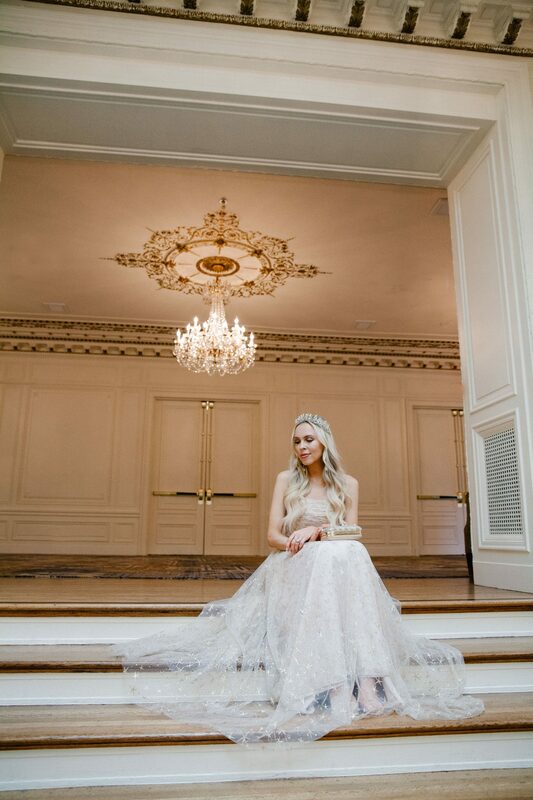 The minute we stepped into the historic lobby I felt like Cinderella at the moment her fairy god mother showed up. 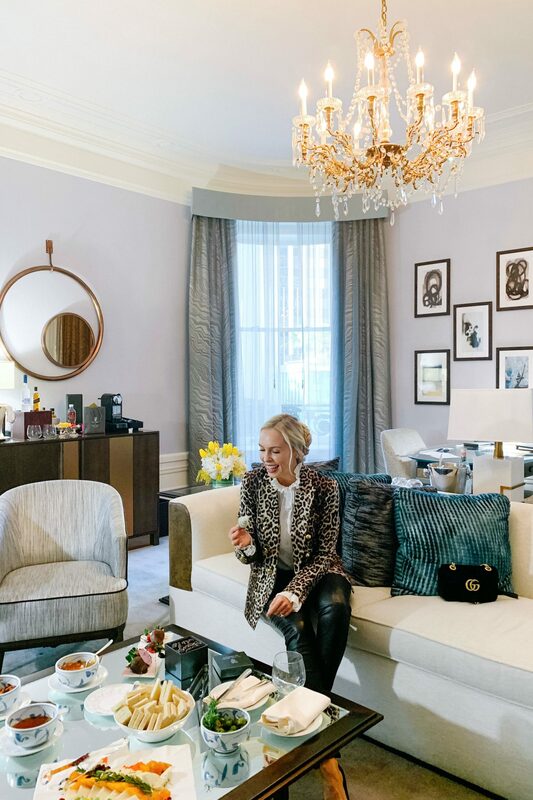 We were whisked away from the gilded entry to our suite and as soon as I opened the door, I knew I would have a hard time leaving it all weekend. 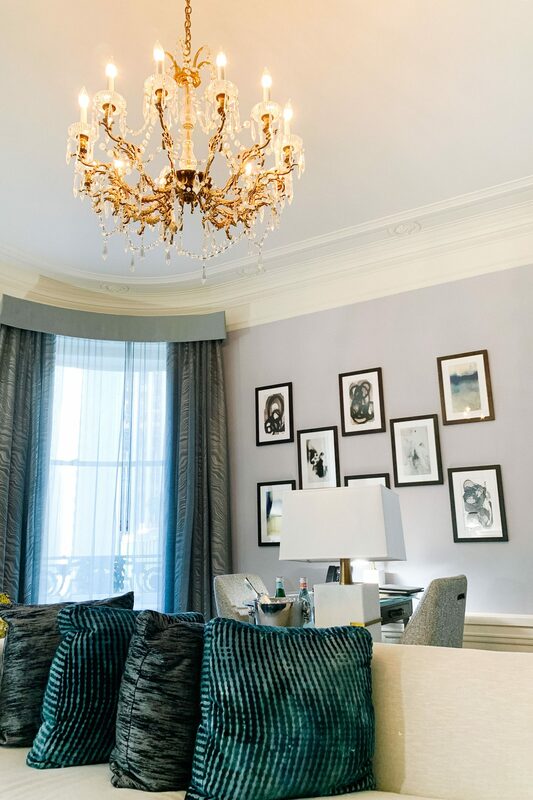 The rich history of this historic hotel echoed in every bit of beautiful molding and luxe chandeliers. I looked out onto to the bustling downtown view and imagined the generations of guests who have stayed in this very room since 1875. I truly felt like I was transformed to a different time, a different life. 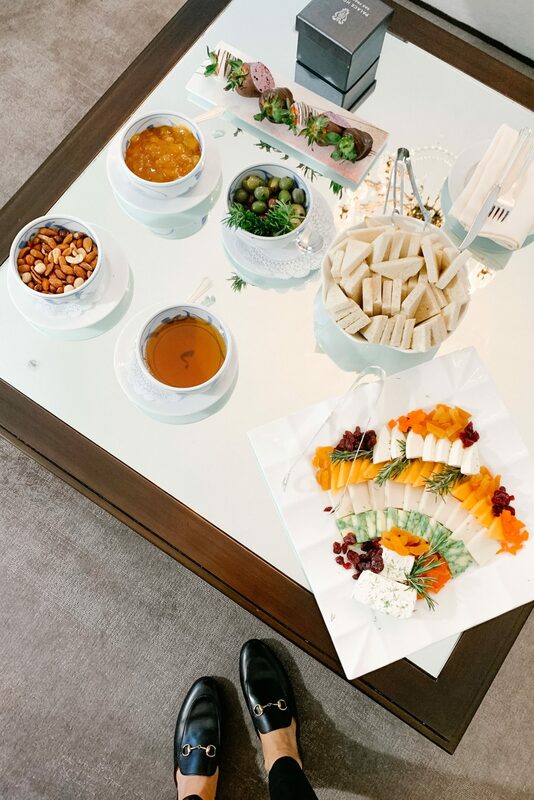 My day dream was short lived as Eric dug into the gorgeous array of welcome bites and the blogger in me immediately stopped him so I could take a picture first! It was almost too pretty to eat! I wanted to savor every quiet moment of peace and lack of sticky little fingers, though I was already starting to miss the girls. We decided to have a low-key night and headed to the Pied Piper for a toast. This bar is a must stop even if you are not staying at the hotel. 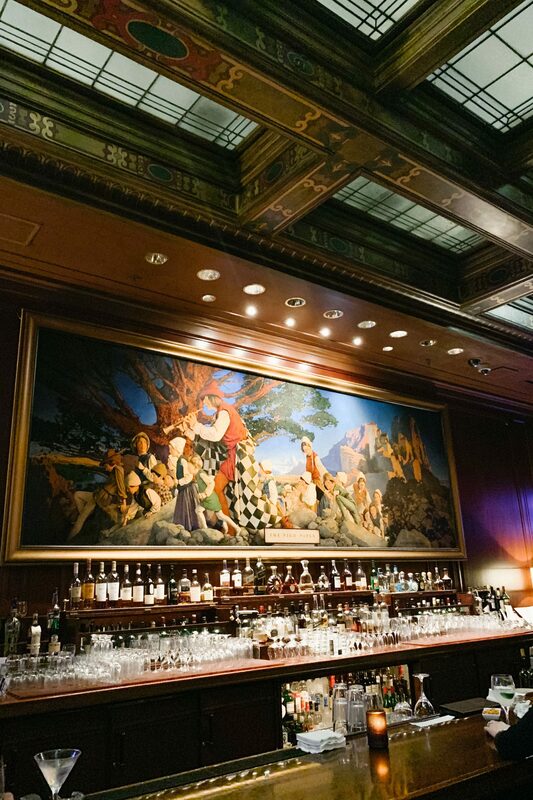 “The Pied Piper of Hamelin” painting, which was commissioned after the 1906 Great Earthquake and fire in San Francisco, and hangs above the bar, is something that you have to see in person. It is so grand and beautiful, you just want to order a classic cocktail and admire its historical grandeur. 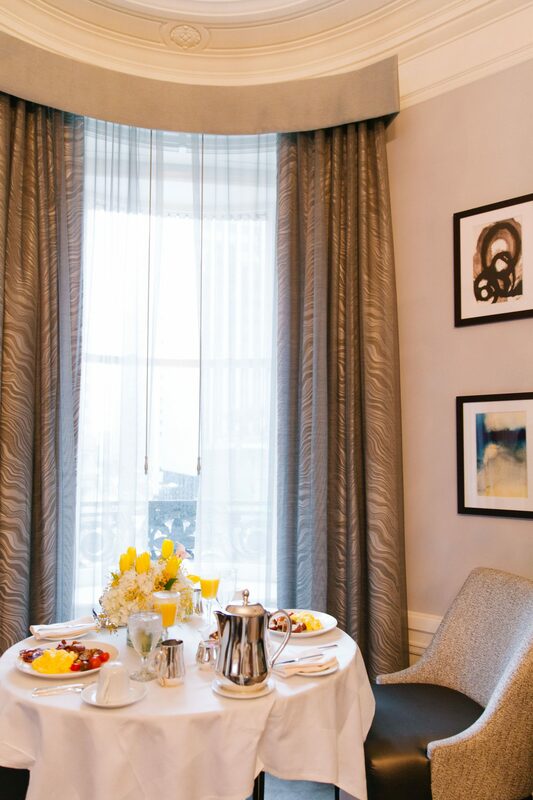 The next morning, we had an early start with room service breakfast (can every morning start like this please?) and a ride up to the epic indoor pool. I have been telling Eric about this pool ever since my last stay at the Palace with my blogger girlfriends last year. With weather in San Francisco being less than tropical, it is one of the only places in the city where you can feel like you’re at a poolside of a far away resort, year-round. 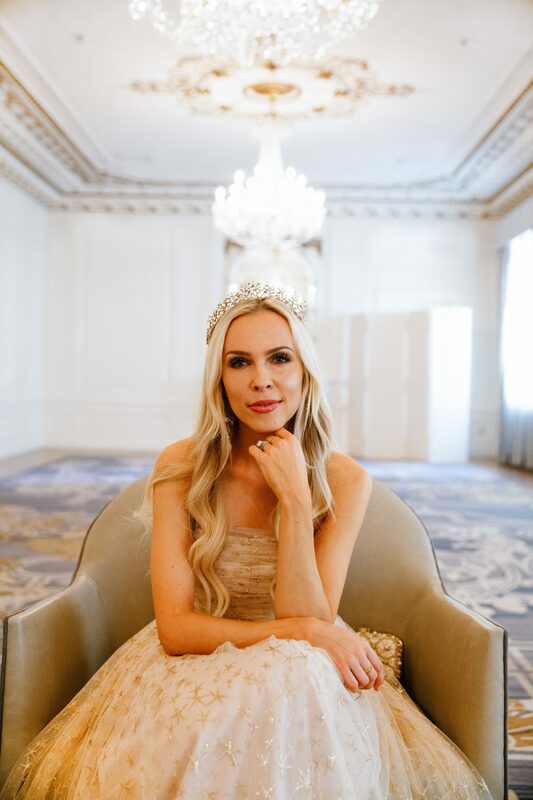 I could have stayed there all day, but I had big plans to have a major princess moment and playing dress up always takes priority over laying by the pool! While browsing through the hotel’s IG page I noticed the most gorgeous ballroom located above the chandelier filled Garden Court. I immediately got giddy and started planning a shoot around its glamorous décor. It’s almost hard to believe such architecture still exists in San Francisco. 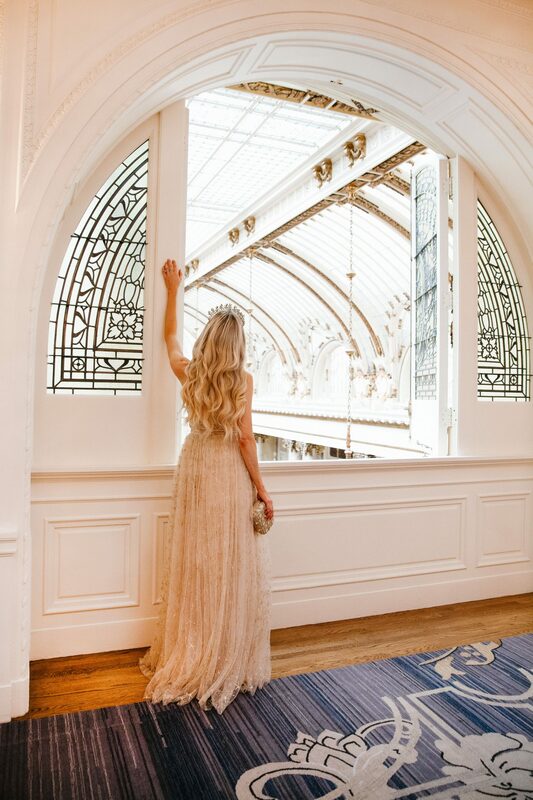 I later told Eric if we could have our wedding all over again, it would be in this room, looking out onto the court. 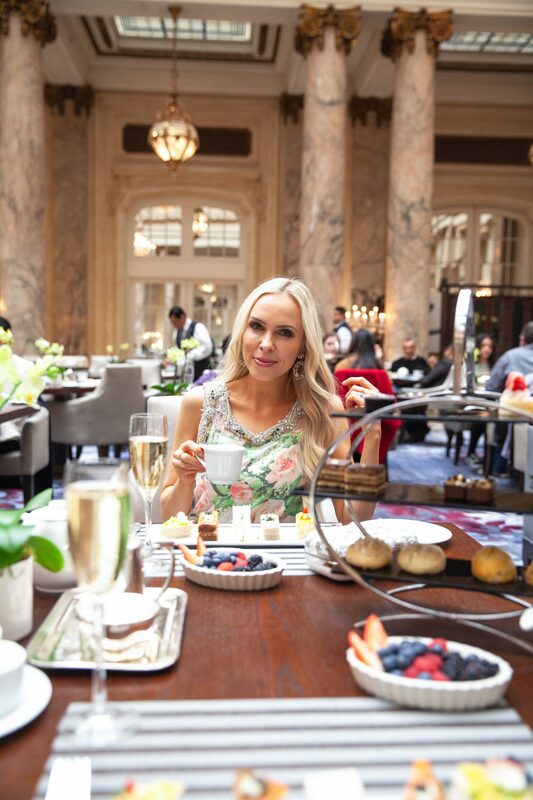 I took in the view one more time and rushed off to our room for a quick outfit change because it was time for our high tea! I’ve been looking forward to this all week. 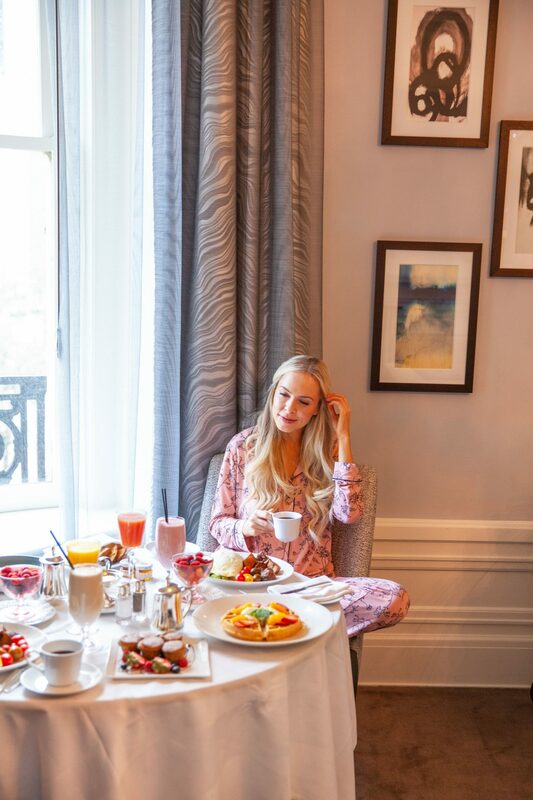 Is there anything better than an afternoon tea in a grand room filled with century old chandeliers? Not for this girl! Especially when there’s a great outfit involved. We were sat in the middle of the room and I took in the ambiance. Everyone around us seemed to have an occasion happening. 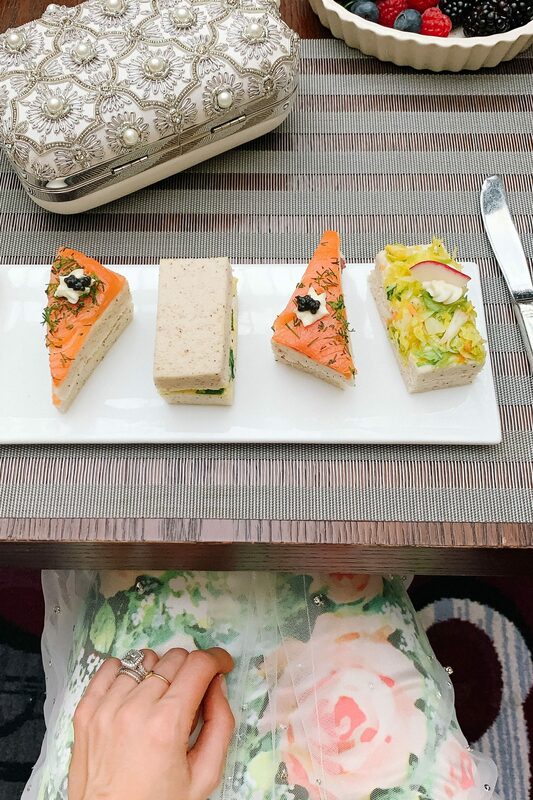 There was a young girl seated with her parents who had just given her a big bouquet of flowers and I wondered what they were celebrating with this special tea time. Next to us there was a big group of ladies celebrating a new bride to be and Eric reminisced about our time being engaged almost 10 years ago now. Oh, how the time flies! We clunk our champagne flutes together and promised each other we would have weekends like this one more often. Just us and a moment to really be together. As the day was coming to an end, I was starting to feel like Cinderella again, but this time looking at the clock which was about to strike midnight. I didn’t want this magical weekend to end. Luckily, we still had one more amazing morning ahead. Our very early Sundays are usually filled with making pancakes and messy art projects, so the thought of sleeping in all the way until 8am seemed like a vacation in itself! 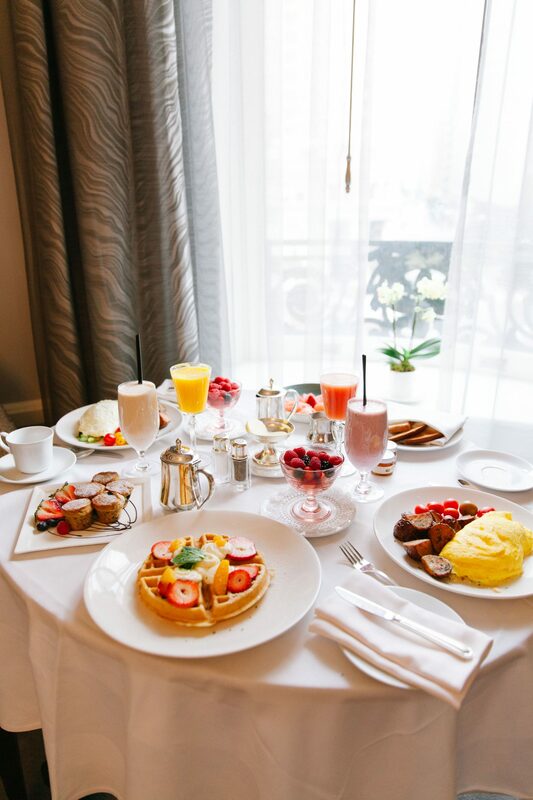 As I lazily perched at my new favorite spot by the window, our breakfast arrived. A feast would actually be a better description. 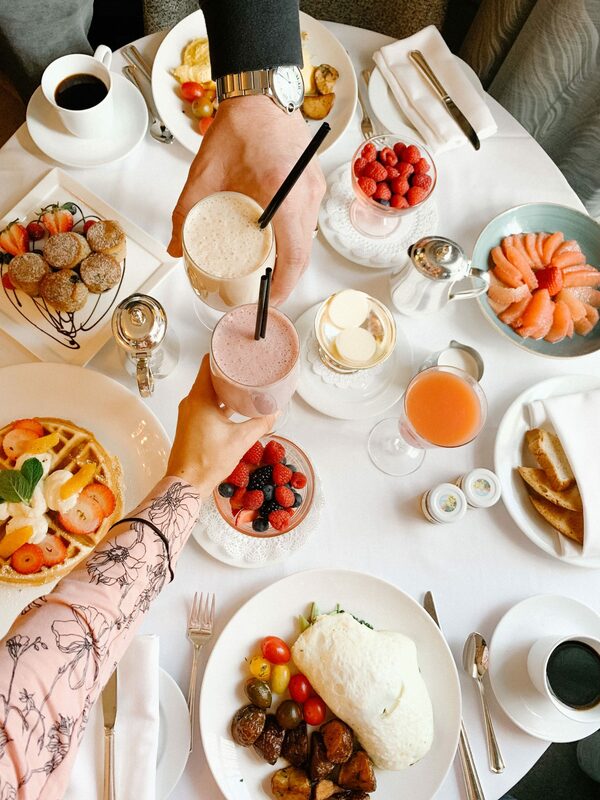 Delicious fruit smoothies and perfectly prepared omelets filled the table. I was in room service heaven! Now we really wanted to hit the pause button. This was truly the best hotel stay I’ve experienced. 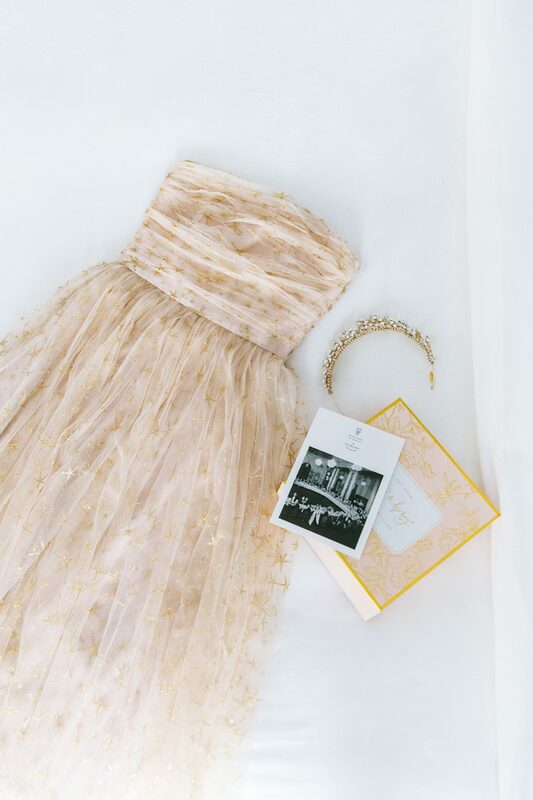 Every moment and detail felt special and curated. Every corner of the property felt like it had a bit of magic glimmering in it. From the moment I stepped through the massive gold embellished doors I felt like I had stepped into a movie. And that’s what a vacation should feel like, shouldn’t it? Like you get a chance to live a whole different life, if only for two magical days. This Cinderella sure felt like she had her time to shine, and now it was time to get home to my little pumpkins. 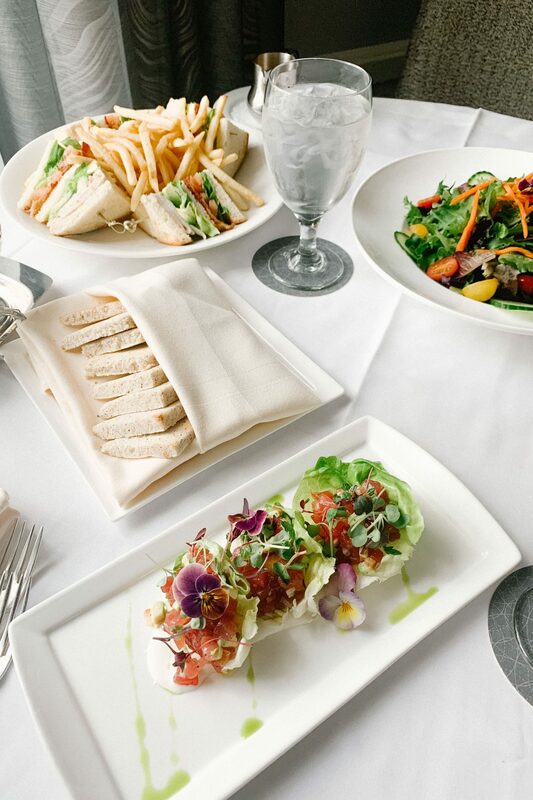 A special thanks to the Palace Hotel for partnering on this post. Next Post Botox and Fillers, and What you Need to Know Before Diving In! Best Staycation EVER. Can we do it all over again please?!?!? !